In this study, we evaluated the potential of the passive restoration approach in recovering the original forest in a region particularly important for the conservation of the Atlantic forest biodiversity. This biome has been fragmented and reduced to only 11.7% of its original range and currently its conservation relies considerably on the spontaneous regeneration of native forests in abandoned agricultural lands, a widespread phenomenon referred to in this study as passive restoration. 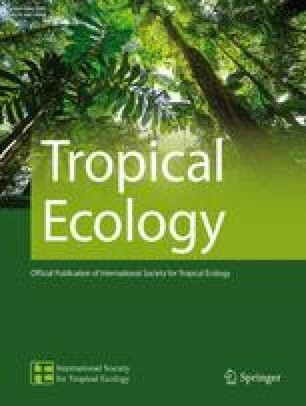 We compare the regeneration strata of a 25-year-old secondary forest (restoration site) and of a primary forest (reference site) based on tree and shrub data in order to evaluate and characterize passive restoration in the surroundings of the Iguaçu National Park, in western Paraná State, Brazil. We recorded 589 individuals from 43 species in the restoration site and 831 individuals from 48 species in the reference site. We found smaller values of density, diversity, proportions of individuals from zoochoric and non-pioneer species; and a distinct floristic composition at the restoration site. However, plant diameter, species richness and proportions of zoochoric and non-pioneer species did not differ between sites, suggesting an appropriate successional trajectory, and the potential for the application of the passive restoration approach in the region. We found a greater number of indicator species at the reference site and some primary forest specialists were not even found at the restoration site, showing the importance of the maintenance of primary forests in the fragmented landscape in order to allow passive restoration to recover original forest attributes. We are grateful to José Nilson de Oliveira and Luciane Trauczynski dos Santos, landowners of the forest fragment where we situated the restoration site; to Geraldo Antônio Daher Corrêa Franco, of the Forest Institute, for the aid in the botanical identifications; to Nelson Luis Viapiana and Valdevino Rodrigues, for the aid in the field work; and to the Chico Mendes Institute of Biodiversity Conservation, for the authorizations to access the Iguaçu National Park.